On February 28, 2003, Guangdong Supreme People’s Court maintained the sentence by the first trial court. When the verdict was read, Dr. Wang Bingzhang shouted, “I was kidnapped! I protest the illegal trial!” His youngest sister, allowed to attend the trial, met with him, and he asked for a copy of the Bible. Since then he has been imprisoned in Beijiang Prison (北江监狱) in Shaoguan (韶关), a northern city of Guangdong province. He is 65 years old now. The next year, he suffered a severe stroke and almost died. His health has declined rapidly since and he suffered two other, milder strokes. Recently in New York, Dr. Wang Bingzhang’s sister Yuhua told an audience that Wang Bingzhang is no longer the handsome, energetic Wang Bingzhang anymore. He walks slowly and needs to support himself with a hand on the wall. He also has life-threatening phlebitis. Every fall he has a bout of pollen allergy. His family is allowed one visit per month, and the only relatives who can visit him are his four siblings, four children and his wife, all of them live either in the US or Canada. None of his cousins, let alone friends, in China can visit him. For eleven years, members of his family have taken turns to visit him every other month, no longer than three months, crossing half the earth and the Pacific Ocean. Each visit lasts 30 minutes, and they speak over the phone with thick glass separating them. Yuhua has made 11 visits, Bingwu 13, the youngest sister Wang Mei 15, his wife 3, and a few by the children. Together the family has made about 45 trips, the last one on August 6th. Yuhua said, I have so wanted to touch my brother’s hands and hug him, but I have never gotten my wish. Per rules of the prison, the relatives cannot bring him food, medicine, or clothes. They cannot give him more care than the 30-minute meetings through the glass wall. 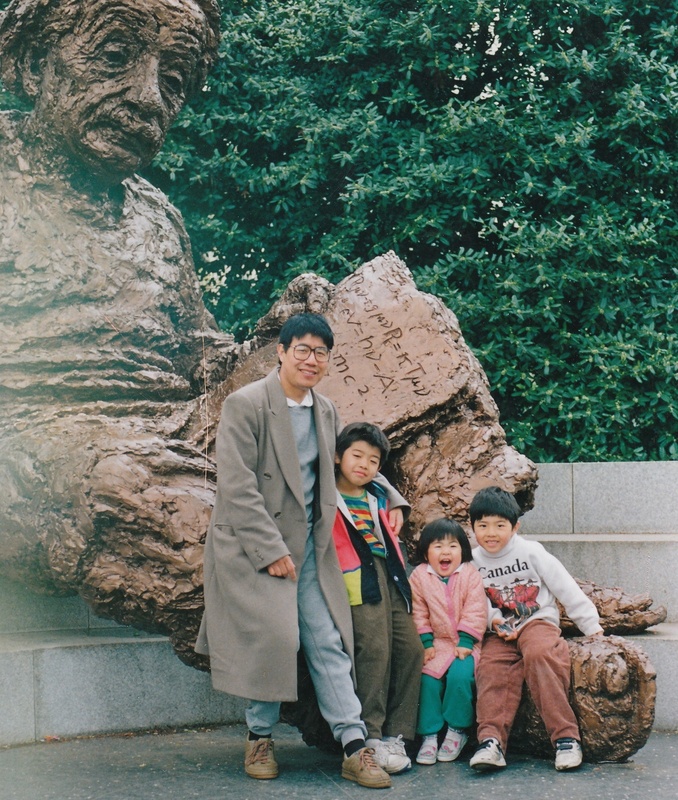 Dr. Wang Bingzhang and his three children in the 1990s. He is allowed to write one letter to his family each month. He is the only prisoner in his prison zone, he wrote, and the only persons he sees are the prison guards. He is taken outside to get air once or twice each day. He is subjected to “political study,” and the “political study” is to get him to write confessions and admit his crimes. If they keep forcing me to do it, he told his brother Bingwu once, he would go on hunger strike. “It is a form of torture.” An officer, monitoring their conversation, quickly walked over to Bingwu and asked him to dissuade his brother from going on a hunger strike. By now Dr. Wang Bingzhang has been placed in solitary confinement for 11 years. The family has repeatedly asked for its removal but to no avail. Solitary confinement, according to UN experts, is a cruel, inhuman or degrading treatment or punishment even when it is applied for short periods of time, and it often causes mental and physical suffering or humiliation. The jail told them that they had no power to change the way he was confined. Once he wrote in his letter how a spider appeared in jail cell, how he watched it every day, how it crawled and stopped, how it spent the night, how it captured its food, and when it woke up. From the letter, the family got a sense of the terrible loneliness he suffered. But at least four or five years ago, relatives had begun to notice Dr. Wang Bingzhang’s mental health problems. He is incoherent in his letters and speech. Meeting with family who came from afar for a mere 30 minutes, he often becomes angry and sometimes hurls insults at them. He is nothing like the brother they know and love. During the eleven years, relatives of Dr. Wang Bingzhang have written numerous letters to Chinese leaders. They wrote to Hu Jintao, to former chief justice of the Supreme People’s Court Xiao Yang, and hope to remove Dr. Wang Bingzhang from solitary confinement, but have never gotten a reply. In 2006 when Dr. Wang Bingzhang’s father died, Yuhua wrote again to Hu Jintao. She hoped Bingzhang would be able to attend their father’s funeral but got no response. In the fall of 2011, at the bedside of their dying 90-year-old mother, the four siblings assured their mother that they would do everything they could to save Bingzhang. Yuhua again wrote Hu Jintao, asking him to allow Bingzhang to come back for the funeral. Again, no response. After their mother died, Yuhua wrote Hu Jingtao again. Like all the letters before, this letter was sent via UPS to Zhang Junsai (章均赛), Chinese ambassador to Canada, but this time, a copy of the letter was also sent to the Canadian foreign minister. The minister called in Ambassador Zhang Junsai to convey the Wangs’ appeal. In November 2011, less than a month after Dr. Wang Bingzhang’s mother died, Yuhua told the media recently for the first time, that Chinese officials from the Ministry of Justice met with relatives of the Wangs in Beijing, asking the Wangs to remain low-key when calling for Wang Bingzhang’s return for the funeral and promising that China would release him. Hopeful relatives cooperated with the Chinese government, declined friends from attending the memorial, and kept it as quiet as possible. They stored their mother’s body in a morgue, and waited for Bingzhang to return. They waited for more than three months until this March without hearing a word. They contacted the Chinese government again. The Chinese government official told the Wang’s relatives in Beijing that the Chinese government would release Wang Bingzhang, but first, please let the dead be buried and at rest. Here I must pause to mention something else. In the winter of 1985, Dr. Wang Bingzhang’s mother, still living in Beijing, applied for a passport to visit her daughter in England. Because of Bingzhang, her application had been repeatedly denied. Yuhua, through a student she taught, found out the address of the late Hu Yaobang, then CCP Secretary General, who didn’t live in Zhongnanhai. Yuhua and her sister went to that address and delivered a letter to Hu to a young man who had opened the door for them and said he was the son of Hu. A day later, a secretary of Hu Yaobang called and told her that she could now go to the Public Security to have the application processed. Their mother quickly was issued a passport, so were all the two remaining siblings, including Yuhua. If not for that window opened up by Hu Yaobang, they would not have been able to leave China. When Bingzhang learned about the episode, he said “China still has hopes.” But barely a year later, Hu Yaobang was forced out and his death in the spring of 1989 triggered the 1989 Democracy Movement. One should understand that, as one of the dissident intellectuals we translated on this website recently pointed out, the survival of a Leninist party such as the CCP depends on suppression of both external political challenges and internal differences. The first lawyer the family hired was Zhang Sizhi (张思之), known for being the lawyer of the Gang of Four. He visited Dr. Wang Bingzhang twice and filed for medical bail on his behalf but was rejected. Later, the family hired lawyer Xiao Xionghui (肖雄辉) of Datong Law Firm in Guangzhou (广州大通律师事务所), signing with him a RMB 50,000 yuan contract for five visits of Dr. Wang. He visited once and never went again, and he has not refunded money to the Wangs. Ti-Anna Wang, in “prison” with father. For eleven years, the family has gone to everyone and everywhere in Canada, the United States and Europe, from governments to human rights organizations to legislatures to UN, to call for Dr. Wang Bingzhang’s release. Resolutions have been adopted, statements made, but none has been heeded by the Chinese government. No, they did heed. Because of their campaigning, Wang Yuhua and Wang Jinhuan, two of Dr. Wang’s three sisters, and Ti-Anna Wang, Dr. Wang’s daughter, have not been able to obtain visa to China since 2009. Dr. Wang’s wife has had a hard time to get visa too. In March and June, the Wangs twice wrote Xi Jinping. In their June letter, they declared their plan for a lasting global protest. On June 27, the eleventh anniversary of Dr. Wang Bingzhang’s kidnapping, the campaign was launched. Native New Yorkers as well as tourists from around the world stopped by the “prison” to learn about Dr. Wang Bingzhang’s plight and the political reality in China. First, the Square’s impersonator of Liberty came and shook hands with the “prisoners.” “Good job!” She told them. An entrepreneur from mainland China came to give his support. An Argentinian student of political science left her support and took away Dr. Wang’s story. A Taiwanese youth who grew up in the US volunteered outside the cage to talk to the passersby. A priest read quietly about Dr. Wang and prayed for him. Curious tourists from mainland China looked on and walked away. A Reuters photographer came and took pictures. A Turkish journalist stopped by and also took pictures. So did a Japanese journalist. Local blogs began to post about the protest. Since last week, the family started offering postcards outside the “prison” for people to sign – postcards to President Obama. The first day, all 500 they had prepared were signed and sent to the White House. They promptly printed another 5,000 and have been sending off a few hundred each day. On Twitter, phone numbers and address of Beijiang Prison where Dr. Wang Bingzhang has been imprisoned is circulated. Meanwhile, “In Prison with Dr. Wang Bingzhang,” strategically placed and visually striking, seems to be catching on. 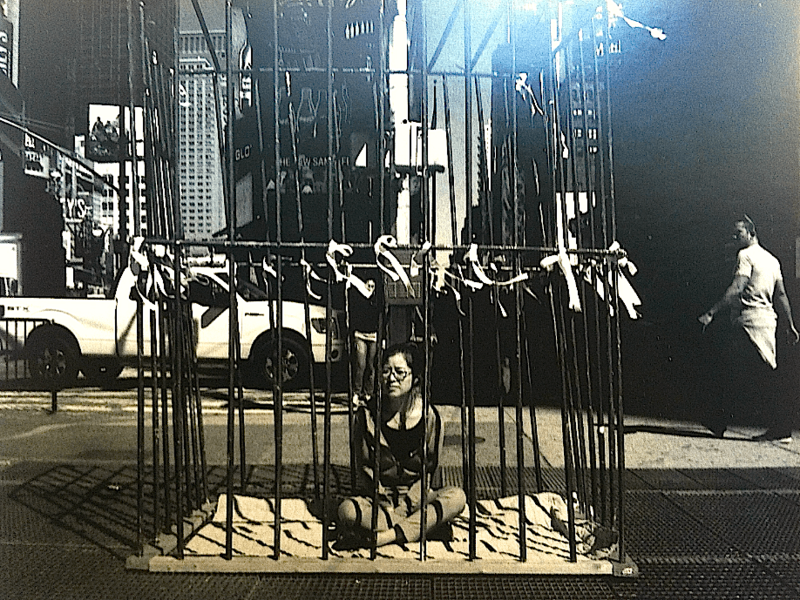 On October First, China’s national day, artist Chen Weiming (陈维明) on the west coast launched his “prison” protest in Hollywood right outside the famed “Chinese Theater.” Another “prison” will launch in Las Vegas next week. Monday, October 7th, six of Dr. Wang Bingzhang’s relatives will commence a five-day hunger strike at the UN Headquarters to demand that the UN investigate the inhumane solitary confinement of Dr. Wang and to call for his release. “In Prison with Dr. Wang Bingzhang”, Times Square, New York, 47th and Broadway, ongoing. By China Change in Human Rights & Civil Rights, Interviews, Rule of Law on October 7, 2013 . Bless you for the exceptional attitude on this particular issue.